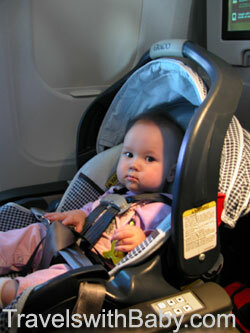 Home family travel	You asked: What are YOUR rights when using a car seat on airplanes? You asked: What are YOUR rights when using a car seat on airplanes? A reader’s comment from last week’s blog post: Will your child’s car seat be allowed on the airplane? has proven once again that not all airlines are created equal in the eyes of parents. In fact, this mother’s recent experience with United Airlines is enough to make you wonder if anyone at United actually knows the so-called rules they feel at liberty to enforce. If you’re planning to use a car seat on an airplane soon, be sure to read this–and consider printing it to carry along with you. Hello Shelly and fellow readers – I’m just online trying to find any info I can on car seats on planes. I just got back from a trip to San Francisco and on our return flight we had a nightmare experience with our car seat!! It’s a long story I won’t bore you with even though I could go on for HOURS about the way we were treated. But basically we were told the car seat had to face forward. I have flown several times with my infant and knew it could and in fact should face backwards. Even after asking them to show me the airline’s rule book, and it stated that it could face forward or backwards and should follow the car seat manufacturer recommendations, we were still told it had to face forward. We were told if we did not face it forward we would have to deplane immediately. The attendants were extremely rude and condescending to us. They humiliated us in front of the whole flight and kept saying that we were holding everyone up and that we didn’t know the rules and maybe should just get onto another flight. I had to bite my tongue and just follow their instructions or risk being thrown off and potentially being stuck in the airport with no way to get home. Shelly, what ARE the rules around car seats on the flight? This was a United flight, btw. If your child was still within the height and weight limits to be using your car seat in the rear-facing position, then that’s exactly how it should be installed on the aircraft. This is not the first time United Airlines has threatened to–or actually deplaned a family for refusing to improperly install their child’s CRS (car seat) on a flight. You can read about a family of 5 that experienced this same scenario twice with United Airlines in this News Release. Diane, and any other parents reading this who have experienced similar treatment by any US-based airline should consider contacting FlyersRights.org, and certainly contacting the airline to report the details of their incident. I am sorry to hear about your troubles, Diane, and I hope this will help for the future. Too bad the flight attendants couldn’t realize THEY were the ones holding up the flight, not your family. Parents, have any of you been told you can’t install your FAA-approved car seat rear-facing on an airplane? How did you handle it? Will your child’s car seat be allowed on the airplane? Believe it or not – FAA AC (advisory circulars) and what ever else you can find on FAA.gov mean very little when it comes to the individual air carrier rules. An AC is nothing more than a recommendation. Each air carrier operates under its own set of rules. These rules are know as Ops Specs. Every Part 121 scheduled air carrier (delta, united, american and so on) have there own set of rules (Ops Specs) that are approved by the FAA. I have never had a problem rear facing my daughter on any of our fights. (Mostly international ~ Delta, TAM and GOL.) I do, however, request bulk head seats so there is no one in front of my daughter, interfering with their seat recline.